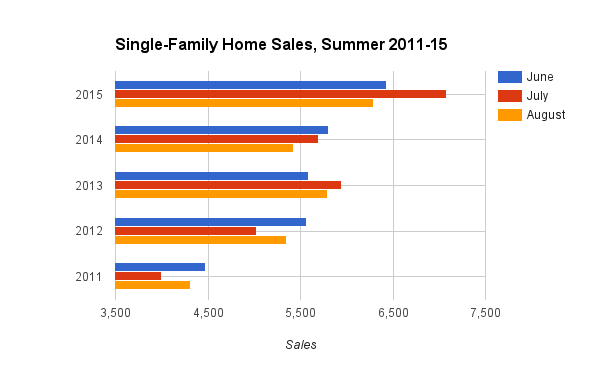 BOSTON, September 29, 2015 – The Bay State’s housing boom continued into August with 6,284 single-family home sales, a 16.0 percent year-over-year increase. It is the third straight month of double-digit growth, according to a new report from The Warren Group, publisher of Banker & Tradesman. Last month was the first time single-family home sales climbed above the 6,000 mark in August since 2005, when there were 6,570 sales. The median sale price for single-family homes in August 2015 was $359,000, a 3.2 percent increase from August 2015’s median of $348,000. Year to date the median price is $345,000, a 3.0 percent increase from last year’s mark of $335,000 through August. The condo sales market was strong in August as well, with 2,433 sales across Massachusetts. This month’s mark was a 9.3 percent increase from August 2014, which had 2,226. The median condo price in August was $330,000, up 1.9 percent from August 2014, when the median was $323,950. Year to date the median condo price has been $320,00, up 1.6 percent from $315,000 at this time last year. Year to date Massachusetts has had 35,031 single-family home sales, an 8.1 percent increase from last year’s total through August of 32,404. There have been 14,566 condo sales through August, a 3 percent increase over last year’s year-to-date total of 14,143. The Warren Group has recorded and tracked real estate transactions since 1872. The fourth-generation family-owned company uses its long-time leadership in Boston real estate and banking information to produce specialized reports and printed publications, including Banker & Tradesman and The Commercial Record. With more than 140 years as a local business leader, The Warren Group has developed relationships with a variety of industry leaders and trade groups, including bankers, mortgage brokers, credit unions and lawyers. Working together with our partners, The Warren Group organizes trade shows and industry events, including The Bank Summit, coming in October. For more information about The Warren Group, visit www.thewarrengroup.com.